This ride takes you over a medium-length mixed loop of fire roads and singletrack (and some paved roads) on the foothills of Mount Tamalpais, while rewarding you with a handful of things worth seeing there. It starts by climbing on Deer Park Fire Road. This is a fire road that follows the spine of a ridge. It's a serious climb, but not discouragingly steep. Its steepest part (which is the first half) averages 12% grade. It then eases up a little bit. Then the last third of it has a slope of 11% once again. While the climb is mostly under tree cover, views open up to the neighboring hillsides once in a while. 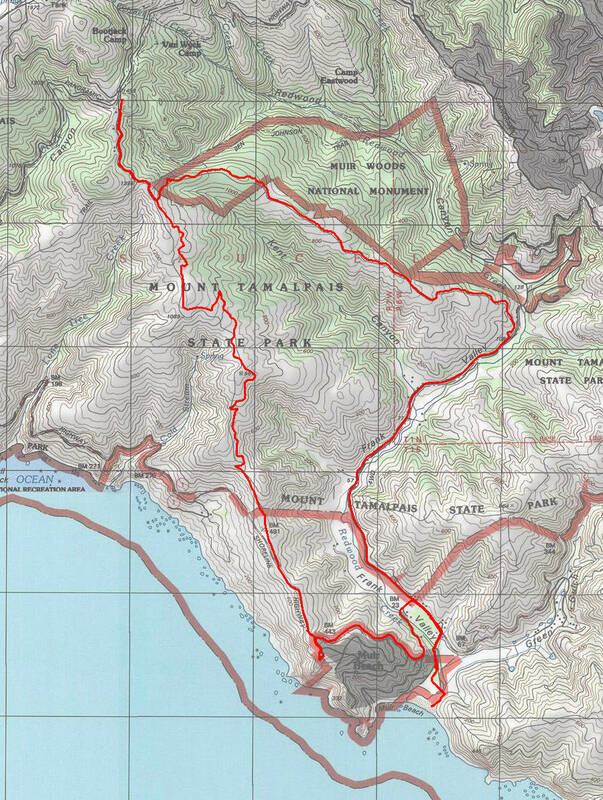 The historic Dipsea Trail parallels Deer Park Fire Road for the whole length of this climb. This is one of the worthwhile things you'll be seeing on this ride (not that you'll be experiencing it first hand, because bikes aren't allowed on Dipsea Trail). The trail crosses Deer Park Fire Road back and forth at multiple spots but never deviates from it significantly for the duration of this climb. This trail dates back to the Mexican era of California and is believed to have been blazed by the Miwok before Europeans arrived here. It's also the course for the famous annual Dipsea Race, which is stated to have the distinction of being the oldest trail running event and the second oldest foot race of any kind in the US. You'll notice that the route features a spur section at its "top". This is to visit the Pantoll Ranger Station. You can purchase park maps, books, and some gift shop items here, as well as find water, restroom facilities, picnic tables, etc. It also happens to be the primary campground area of Mount Tamalpais State Park and an intersection of many trails, so it's not a bad place for a rest stop featuring some good crowd watching. I count this as the second thing worth seeing along this ride. Whether you'll agree with me that it's worth this side trip is up to you, because that spur you see on the route plot adds an extra 200 feet of climbing and 1.2 miles of distance to your ride. You can make this ride a little bit easier by bypassing this. Next starts the most scenic part of the ride, where you descend along Coast View Trail. Not only does Coast View Trail stage vistas of beautiful coastal hillsides and the ocean in front of you as you descend, but it also happens to be a very nice singletrack though perhaps a fairly wide one in some places. It's a really rare treat in Marin County, but this trail is pretty enough that it would have qualified as a treat even if singletracks were a dime a dozen in Marin. This is a beautiful singletrack descent by any standard. Coast View Trail ends at Highway 1 near Muir Beach. Once you come all this way to Muir Beach, it would be a shame to leave without taking in the views from Muir Beach Overlook. The route shown on this page features a spur toward the overlook before continuing on its way. This overlook is one more thing worth seeing on this ride. When you reach the intersection of Highway 1 and Muir Woods Road, you might want to consider straying from the main loop a little bit to visit Muir Beach itself (as indicated on this route). It's worth a peek if you haven't been there before or if it's been a long while since you have. The section of this loop on Highway 1 will have moderately heavy traffic on any weekend with good weather. Once you return to Muir Woods Road, though, the traffic is much lighter and it only takes a few minutes to make it back to your starting point. If you feel like sitting back and treating yourself to something tasty after the ride without getting too far away from the gorgeous setting of this route, The Pelican Inn in Muir Beach is one obvious option you should consider. Don't expect to be able to just walk in and find a table there, though. This place is very popular. For those willing to range a bit farther (less than four miles from the beginning of this route), Mountain Home Inn is another easy recommendation, with excellent food and a great view. On the other hand, the same difficulty of getting a table would apply there too. Your next best bet could be the eateries around Mill Valley. For a couple of suggestions there, check out the last paragraph of my Marin Headlands ride descriptions.